The Lady of Winterfell, Catelyn Stark is the eldest child of Lord Tully of Riverrun, one of the great magnates of the realm. She married Lord Eddard at a time of war in lieu of his elder brother, who had been murdered by the Mad King. Mother to his five children, she holds to the Tully words of “Family, Duty, Honor”, and is a warm and loving mother and supportive wife. However, there is one thing that divides Catelyn from her husband: his illegitimate son, Jon Snow, who was fathered during the war and who has been raised at Winterfell among Eddard’s legitimate children against the customs of the Seven Kingdoms. Despite this, love and respect has grown between the two over the years. 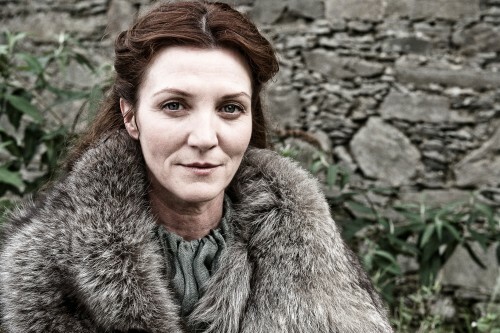 Catelyn’s auburn hair and blue eyes is a common trait of the Tullys of Riverrun. Convinced by her son, Catelyn travels to where Renly Baratheon is encamped near Storm’s End. Recently wed to Margaery Tyrell and proclaiming himself king, his gathered host could make a great ally to Robb. She is welcomed by Renly, but he makes it plain that he means to rule all the Seven Kingdoms, including the North. Catelyn attempts to get Renly and Stannis to put aside their differences, but fails. Finally she appeals to Renly directly, only for him to be murdered before her eyes by a living shadow. She flees with Brienne of Tarth, Renly’s latest kingsguard, as she knows they will both be blamed for Renly’s murder. Brienne swears herself to Catelyn’s service and journeys with her to Robb’s encampment. Catelyn discovers that Robb has fallen in love with a foreign noblewoman, Talisa Maegyr, and seems disapproving of this. However, Robb and Talisa travel to the Crag, and Catelyn is left to deal with the explosive results of Jaime Lannister’s bloody failed attempt to escape. Knowing that Lord Karstark’s men are preparing to murder him due to the death of their lord’s son, she confronts Jaime, and decides to free him with Brienne as his guard, thereby intending him to be taken to King’s Landing in return for her daughters. However, Robb is angered by what he sees as a betrayal, and Catelyn fails to explain her reasoning. Robb orders her to be held under guard, and later that night marries Talisa.